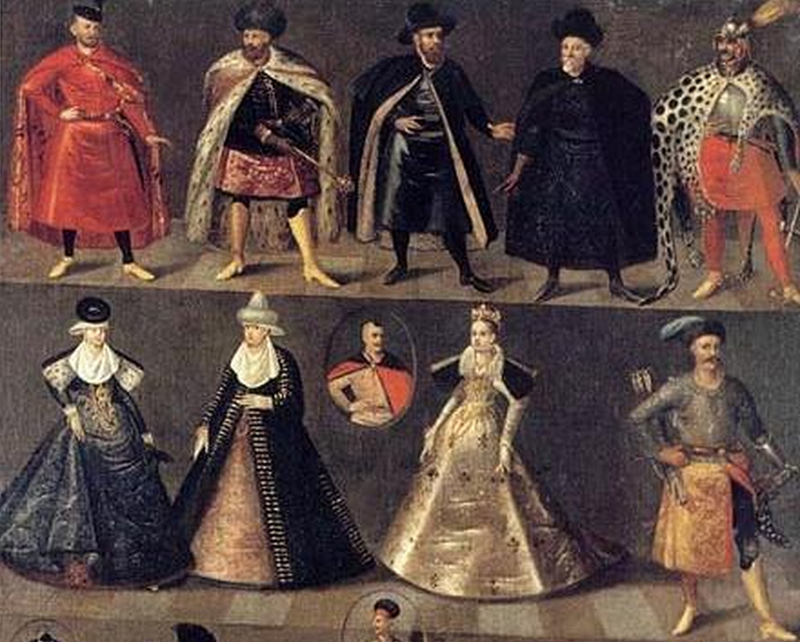 I have failed to include into my blog this famous and perhaps quite controversial image of the Polish nobility, soldiers and horses, associated with the reign of His Royal Majesty Sigismund III.. 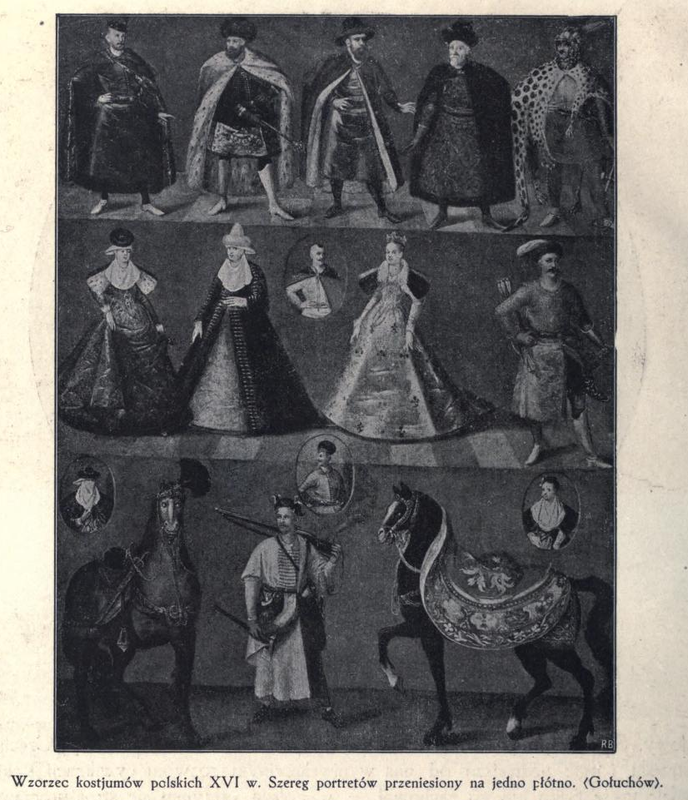 According to Zdzislaw Zygulski jr. (''Broń w Dawnej Polsce'' p.295) - this important iconographic primary source in a form of a panel painting ( Tablica Gołuchowska - 'Goluchów costume tableau' o 'Gołuchowska Board') contains various types of Polish noble civilian and military attire dated to the beginning of XVII century, however it appears to be of a later date than the famous 'Rolka' painting. It is held at the National Museum at Poznań, but came from the famous collection started by Izabela Działyńska at the Czartoryski's Gołuchow Castle(previously the seat of the Leszczyński clan ). Amongst various figures, both male and female nobility) painted in a somewhat miniaturist manner, we find a figure of a winged hussar armed with nadziak (warhammer) and sabre, with his head covered by a gilded helmet (shishaq/zischagge) adorned with a szkofia (aigrette), armoured with a gilded, four-lames breastplate and mail arm protection, underneath the armour he is wearing a short military żupan, red, tight trousers with buttons on side (not unlike later hussar pants during the Napoleonic and later periods), short yellow leather boots with long, gilded spurs. Zygulski jr writes that the wild animal pelt on his shoulders is a cheetah skin while Richard Brzezinski, in his 'Polish Winged Hussar, p 48, writes that this pelt only appears to be a leopard one, where it was dyed with spots to make it look like one. 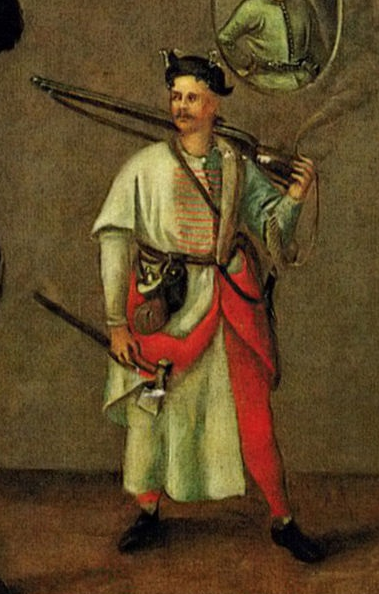 The second cavalryman - a kozak officer - is armed with an Oriental bow(bow in a bow case) and arrows (in a quiver), and sabre, while his torso and arms are protected with a mail(maile) armour, rather short, worn over a longer than the winged hussar , brocade żupan (with a red lining). His left arm is covered with additional steel protection known then as zarękawie or vambrace. Fine long yellow leather boots encasing tight, black pants, and a fur hat or 'kołpak' with long blue textile hat bottom complete his martial attire that is very Polish and very officer like. Finally we have another soldier there, a typical Polish infantry soldier or a 'haiduk' armed with a sabre, war ax, and a firearm, which according to Mr. Brzezinski is an arquebus (Polish Armies, vol. p 40), he carries a match wound on his left arm; although an infantryman he has no 'bandolier' or a belt for carrying the measured charges, but has a powder flask and bullet pouch at his belt, while over the left shoulder he carries a canvass bag for his firearm. With his head covered by a black 'magierka' hat (with several small pipes stuck into the brim), he is wearing an early uniform consisting of a white red-lined żupan (and most likely wooden buttons) and a short-sleeved, white delia or 'delijka' also with red lining and with passementerie loops and butons, with a belt tied at his waist. Under his overcoat (delijka) and coat (żupan) he wears tight red pants while black 'trzewiki' or short boots are on his feet, all of this to complete an image of an early European uniformed infantryman, second to the Ottoman Turkish infantry in their uniform appearance (an article in Polish about Polish infantry prior to 1655AD by Tomasz Rejf). Perhaps next time I will discuss a bit the horses and horse tack from this painting. 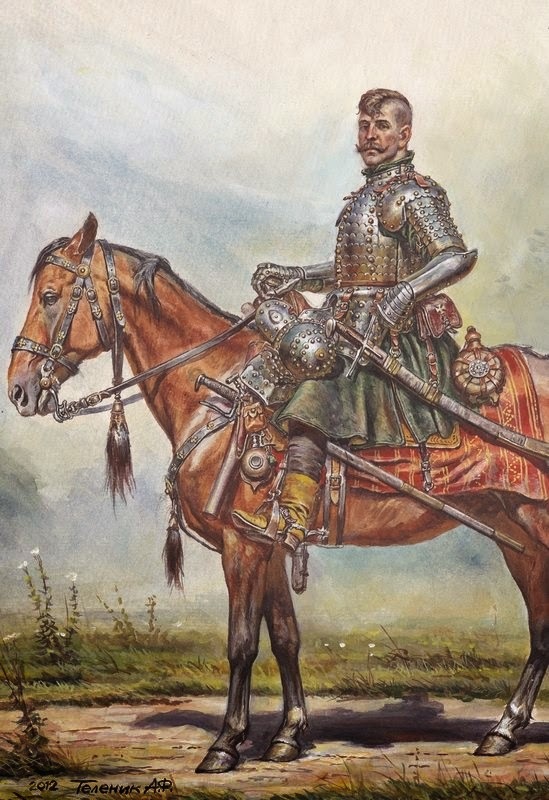 another great piece by Anatoly Telenik - a detail of a larger painting showing Polish Commonwealth winged hussar comarade - the armour depicted comes in part from the Polish Army Muzeum in Warsaw, and it is called 'anima' type and dated to circa 1620AD.